To celebrate the iPhone’s 10th anniversary, industry analysts feel that Apple may now skip the conventional ‘S’ upgrade and take a giant leap towards the “rumoured” iPhone 8. Irrespective of what they decide to call this heavily upgraded new model, people, Apple fans in particular, hope that the company introduces radical design changes at least now, having lagged behind in innovation over the last few years. Based on all the rumours, hype and expectations centred around what the phone may be all about, some graphic designers have come up with various designs and features of the iPhone 8 that Apple worshippers are awaiting with bated breath. Not all these conceptualized versions and features will be bang on – some may borderline as ‘obscure’ while others could be labelled fairly ordinary. Nevertheless, it does offer an approximate idea of what to expect in the much-awaited iPhone 8, come September 2017. 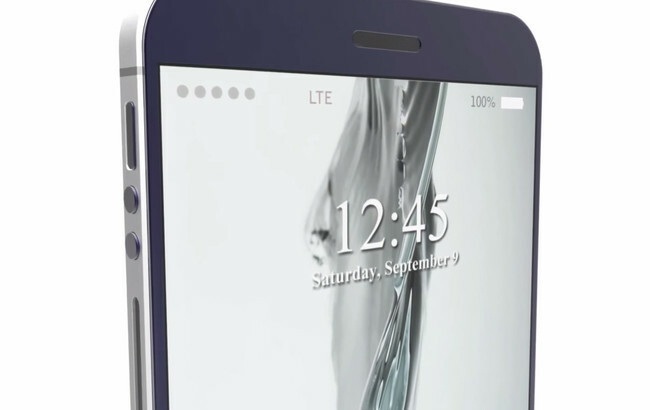 Back in 2015, prior to the 6s release, Jermaine Spit conceptualized how the iPhone 8 would possibly look and feel like. In his concept, he rendered two screens, one on either side. While one screen would be a 2K display mainly for media – watching television shows, films, etc., the other would be a low-power 480p display for regular tasks, thereby ensuring powerful battery life. This iPhone 8 supposedly showcases a metal band around the centre and sports front and back glass panels. This creates a sandwich, pretty much on the same design lines as its predecessors iPhone 4 and 5. This site has designed a concept image of its visualization of the next iPhone, which however is doubtful to materialize, given the wafer-like slimness, concentrated square shape and erratic camera placement. Geskin’s idea of the Apple iPhone 8 is rather intriguing, and adheres to the rumoured edge-to-edge curved display, demonstrating how potentially splendid-looking the new Apple device could be. Although it remains unclear whether the home button has remained or is eliminated, it seems Geskin has retained the dual-lens camera, akin to the iPhone 7 Plus. They have crafted a somewhat farfetched concept for the phone – exaggerating the rumoured curved edge display and curving both sides of the phone to render a squashed cylinder-like effect. The dual-lens camera is retained, however, here it has been moved to uppermost centre of the rear panel, in contrast to its placement in the top corner as in the iPhone 7 Plus. It is believed that Apple will most likely not move the camera, having left it in the top left corner since the very first version. 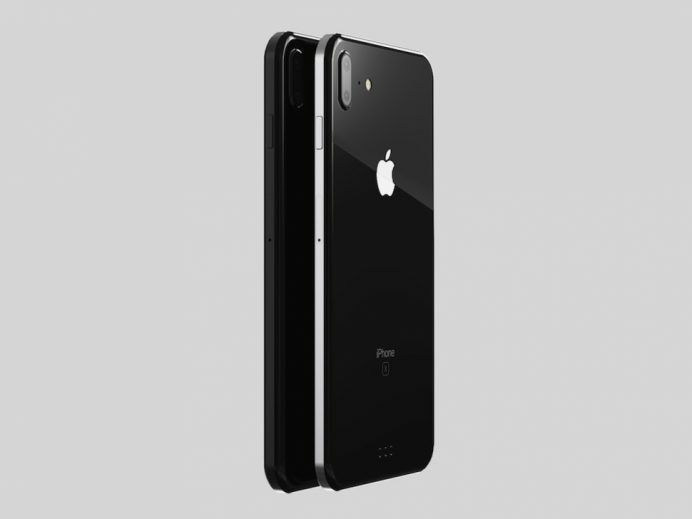 ConceptsiPhone’s brief YouTube video demonstrates their abstracted version of the iPhone 8, depicting a dual-lens camera and connector pins. This version has no physical home button, the fingerprint scanner is embedded into the display, and the bottom of the phone hosts a touch panel that can vary its functions according to the app being used. It also boasts of an edgeless display with impressively slim bezels on the bottom and top. Though it is improbable that the actual iPhone 8 will sport two screens, like Jermaine Spit’s version, rumour has it that it will boast of an all-glass design. It is also believed that this new iPhone 8 will have a better-looking bezel-less display and Apple will ditch the home button to include an embedded Touch ID fingerprint scanner instead. ConceptsiPhone’s version is therefore by far the most realistic one, keeping in line with maximum rumours currently doing the rounds. While it is contemplated that there will mostly be two iPhone 8 models, some propose a higher-end third version too. While we can only wait and watch, here’s hoping Apple take us by surprise, this time at least.